It finally began to feel like summer this weekend! Which is awesome, because it’s only Spring. After a very rainy and dreary April it was nice to get some hot weather our way. 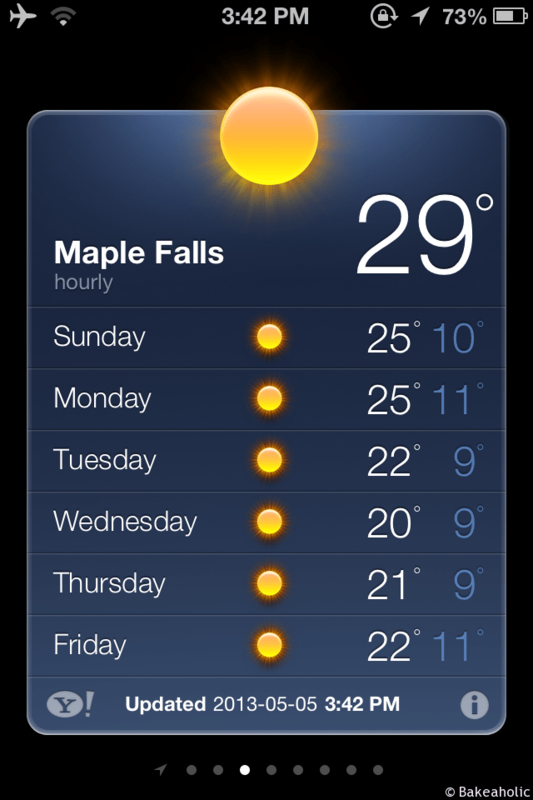 We headed down to the States on Friday to spend the weekend with Adam and his family at Maple Falls. The only thing wrong with the weekend was the hour and ten minute wait at the border going down. However, luckily for us it was about a 5 minutes wait coming home. We took advantage of the glorious weather and went bike riding, swimming and walking in the sun. We biked into Maple Falls and discovered some new trails, including a road that lead us to this sight. We rode up to to see a large building on fire surrounded by fire trucks. 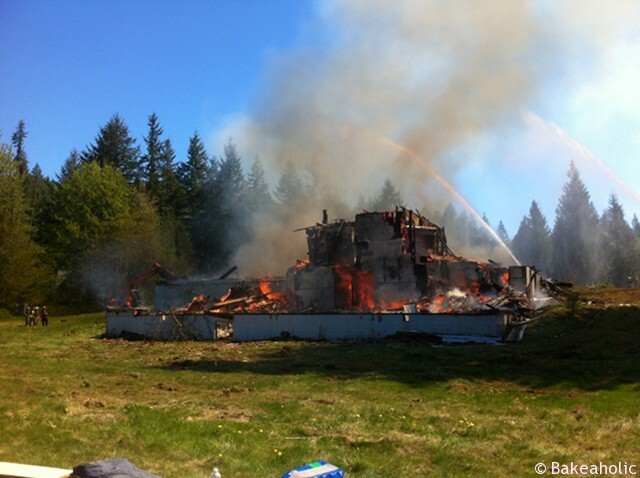 We asked a bystander what was going on and they said it was a controlled practice burn. Turns out it used to be the old elementary school but due to asbestos and the age of the building it had to be taken down. This was also a practice run for soon-to-be firemen who were getting used to the water nozzles. They weren’t allowed in the building because of the safety hazards. It was sure a sight to see, and we were quite close to it actually. There was a basketball court not too far that some kids were playing at, and some neighbours had brought out their lawn chairs to witness the burning. 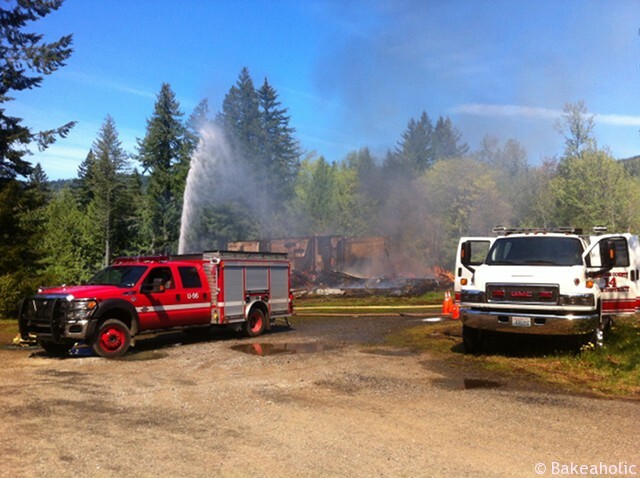 It was already super hot out Saturday morning, and standing next to a giant blaze made it even hotter. We rode over to the gas station to get some refreshments. 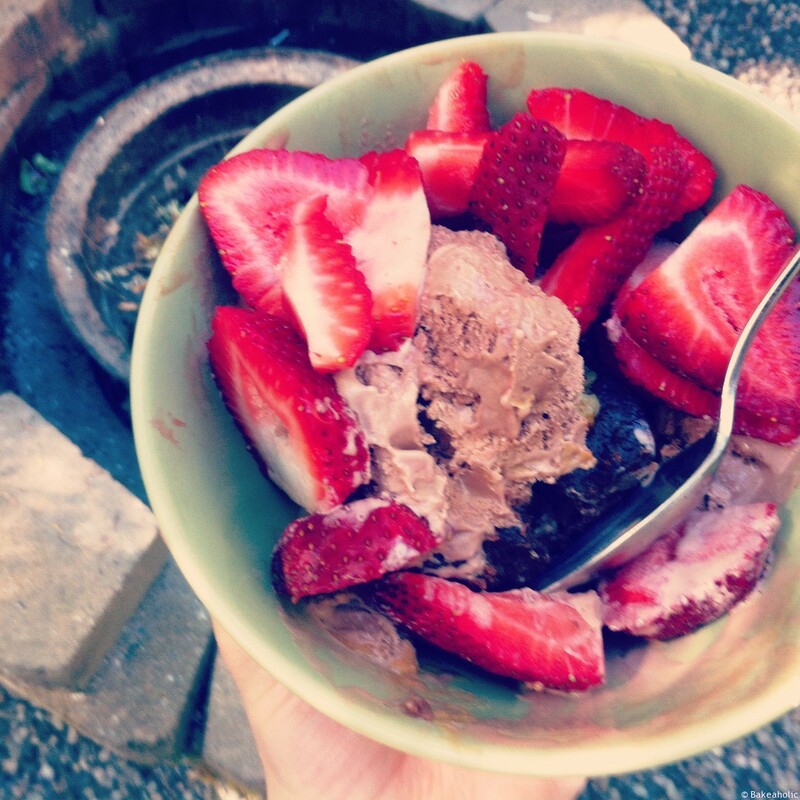 And later after swimming, some leftover brownie with ice cream and strawberries. Refreshing – definitely hit the spot. 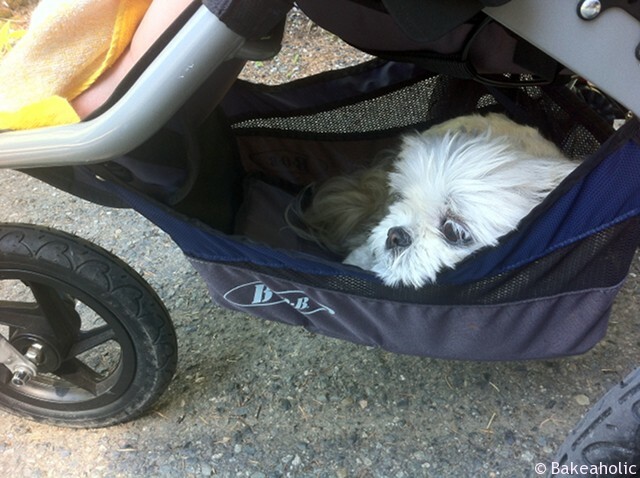 We took our niece for a walk with Lainey, but after a little while Lainey decided she had enough walking in the heat – so we gave her a little lift in the buggy. At first she wasn’t sure about it, having to push her into it, but after a moment she realized how much better it was and decided to get nice and comfy for the ride. Another way to cool off? Banana Ice Cream. 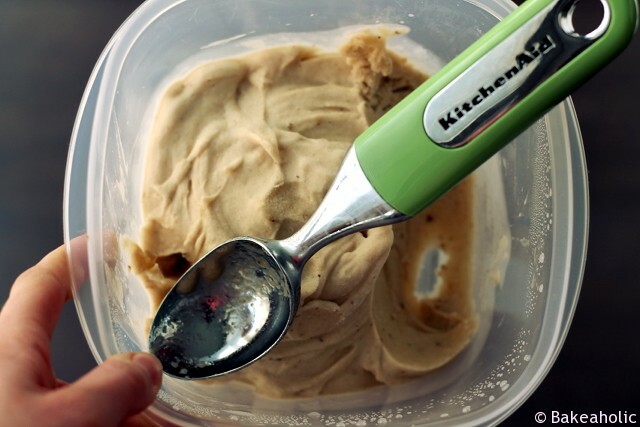 This one-ingredient ice cream was all the rage last year, with someone even making a banana ice cream maker (which, really, is sort of ridiculous). All you need is some ripe bananas, and a food processor. I had made it last year, but for some reason I wasn’t quite sold on it. Maybe it was the bananas or the fact that I think I made it in a blender – but I didn’t love it. However, having made it again now with a food processor I really, really, love it. I was looking for something to make last week with the ripe bananas on the counter, something that wasn’t banana bread or muffins. And actually, these banana’s were already frozen in my freezer – so I still had ripe bananas on the counter to use up (and I did, i’ll share that later). I had thrown a bunch of ripe bananas in the freezer to use in smoothies, but hadn’t used them yet. It’s naturally sugar free, raw, vegan, and all other allergens-free ice cream. Unless you’re allergic to Bananas, then I feel very sorry for you. Ripe bananas. You don’t want mushy, brown or gooey bananas, however. You want the banana peels to be spotted, but the banana’s themselves still good looking with few or no spots. The sugars will have just started to break down, making them sweeter, but the banana is still firm. This will give it a better consistency when making ice cream. Freeze them thoroughly. I’ve seen people do this with banana’s frozen for a half hour or so, but my banana’s had been in ziplock bags for at least a month – Now, I’m sure you don’t want to wait that long, but toss your cut up ripe banana in a bag and wait a few days, even a week until you make it. If they aren’t frozen enough the texture will be too runny. Slice them up, freeze them on a cookie sheet in a single layer and then transfer them to a plastic bag to freeze further. Food processor. If you don’t have one you can try a blender but I’m not sure how it will work out texture wise, you might need to add a little liquid to get it moving around in a blender. And that’s it. Banana Ice Cream. Turn food processor on and blend bananas, stopping to scrape down when needed. Allow to blend until smooth. You can eat the ice cream as a soft serve, or freeze in container to harden. 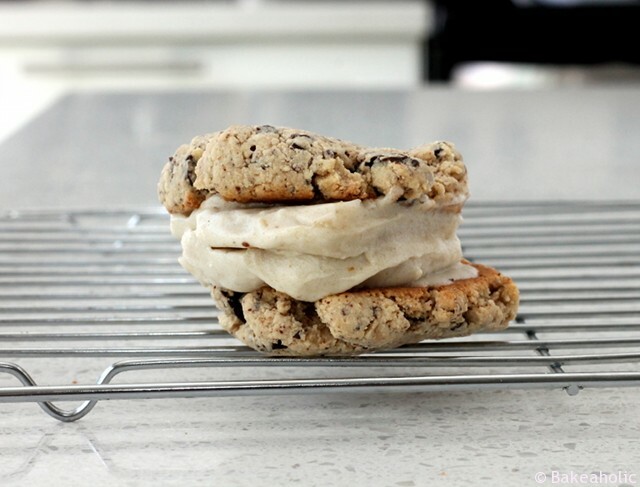 How about a Banana Ice Cream Sandwich with Gluten Free/Wheat Free/Dairy Free chocolate chip cookies – A totally Dairy free, Lactose Free and allergy free ice cream sandwich! Perfect for warmer weather. I suggest using a ‘non’ stuffed cookie with this one. The banana chocolate chip cookie combo is definitely amazing. To make the ice cream cookie sandwich, spoon banana ice cream on a cookie, top with another cookie then wrap in tin foil and freeze for 10-20 minutes before eating. Or, eat immediately for a slightly messier ice cream sandwich. Well, that definately looks yummy! Even Uncle Marv was impressed, especially sandwiched inbetween the cookies! Uncle Marv is busy getting ready to go fly fishing with his buddies and filling out the “limited entry” tags for you know what in the fall! Where the “house warming” gift came from. My Andrea makes him cowbow cookies to take with him on the fishing trip. Beauty of a days. Hugs Aunt Weez. Thanks Ceara! Hope you like it!